This was an amazing dinner! Back a few weeks ago Will and I hosted our school's food club at our house. The theme was "small plates." I made this Korean Beef for the party. Will fell in love with it, so I wanted to make it again. The great thing about this recipe is it is ready in about 15 minutes. Plus- you can serve it with lettuce leaves or tortillas. The recipe is available here. I highly recommend you give it a try. I was thinking you could do this with any ground meat, tofu, tempeh, grated veggies....almost anything! I wanted a side dish to go with it, so I decided to make some stone ground grits. I wanted to try out a recipe I found on Pinterest (which is where I get most of my new recipes to try). The recipe is here. This is very similar to the way Southerners make their grits. My mom always used milk, so this method using heavy cream wasn't that strange to me. 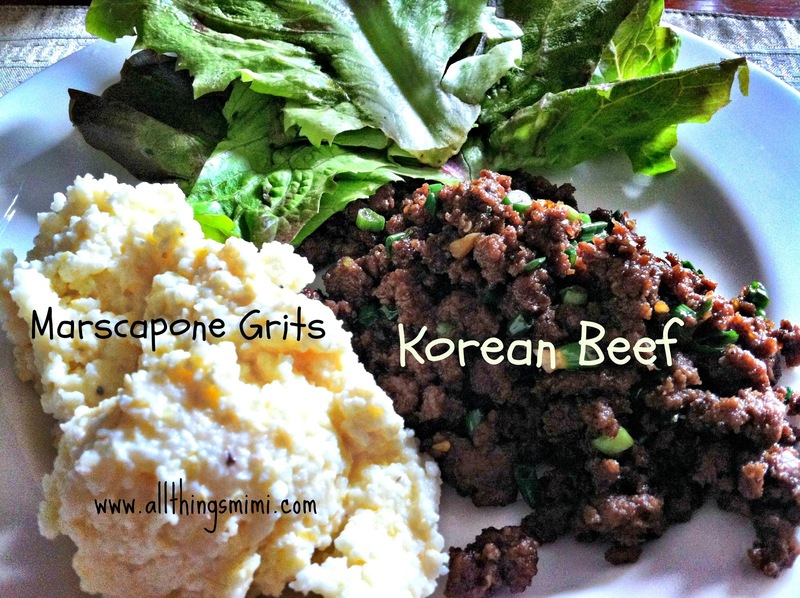 I also love that it uses stone ground grits instead of quick cooking grits. When you cook really good grits for a long time, they get so soft and flavorful. I think quick grits always have a dry, gritty texture. If more Yankees tried these grits, they wouldn't be just a Southern specialty. I went with the original version and used marscapone- the person on the blog substituted cream cheese, which I'm sure was good, but I used the real thing because I had it on hand. The only change I made was to throw in a handful of grated parmesan for a bit more salty, nutty flavor. These two very different things went great together! I will do this again soon.